"I live in Highbury with my boyfriend Matt, a journalist. We moved here a week before I opened the shop in Clapham. Why, people ask me? Because Matt grew up round here and has a lot of family and friends nearby. Mine are scattered all over so apart from the shop, I had no attachments to Clapham. Although it would be easier to walk to work! Our flat is tiny – we christened it the ‘corridor’, so I feel Sew Over It is more of my home. Since opening the shop, my days have never been busier. I have never worked such long hours but I have also never been happier. I spend four days a week in the shop and two days working from home. When working in the shop I aim to get there for 9am. I get up around 7am and try and tip toe around the flat as Matt doesn’t get up until later. I usually put my clothes out the night before so I don’t have to search in the dark for them! I always try to wear something I have made, be it a dress, earrings or a necklace. 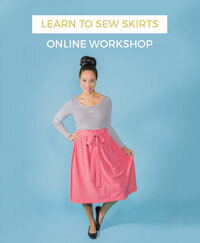 I think it is important that I am an advertisement of what you can do with sewing! I love cereal so breakfast is my favourite meal of the day. Then I have a cup of Yorkshire (tea) and off leave the flat around 8am. I have recently bought a little Fiat 500, Lucia I call her, so I drive to work. I hate the tube and this is my luxury. I love driving to work, I put on the Today program and I am in my own little world with no sweaty armpits in my face and grumpy commuters, just a little road rage ☺. The route I go takes me over Tower Bridge and it lifts me every day – such an amazing view. When I arrive at the shop, Georgie and I clean the shop and get it ready for the day. At 9.30 we sit down and have a cup of tea (Yorkshire of course) and talk about the day. 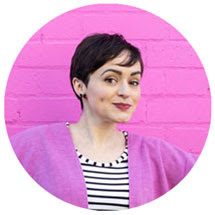 Georgie only started in October and she has been an amazing addition to the Sew Over It team. She is a whizz on photoshop and a very creative machine embroiderer. Our lessons finish at 1pm and then I go upstairs and spend the rest of the afternoon in the shop with Georgie. Lunch is usually a sandwich that I eat whilst writing emails. There isn’t usually time to stop. My afternoons can be very varied. We could be working on our shop display, sewing new products for classes, writing newsletters, scheduling classes and speaking to customers. We are currently working on our online shop, which is a much bigger job than I thought it would be. I am hoping it will be live in the New Year. 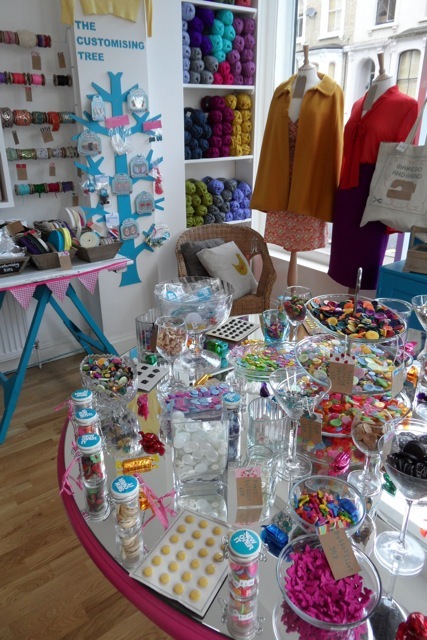 We will sell sewing kits, patterns and gifts and then fabric eventually. Dominique, who also teaches, is helping me with this. She is a whizz on the camera and Photoshop – whereas I am hopeless. 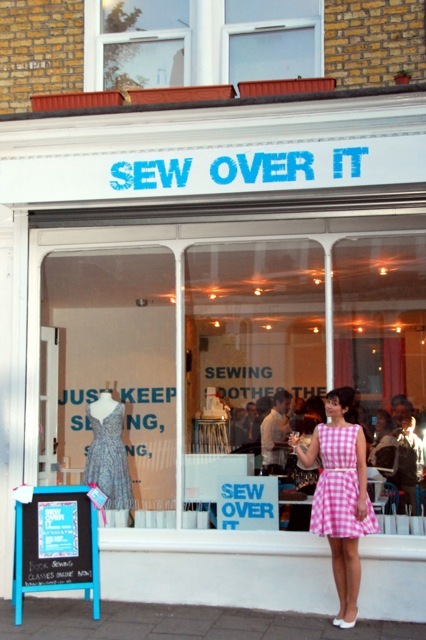 We are also working on a Sew Over It merchandise range – sewing boxes, needle cases, travel kits and more. So excited about seeing the prototypes – it has been great fun designing them. Georgie leaves at 6pm and I get ready for my evening classes. At the moment I teach on Tuesday, Wednesday and Thursday evenings, although in the New Year I will drop one evening. Our class sizes are always bigger in the evenings so the atmosphere is a little different. I guess there is more of a buzz with larger groups. 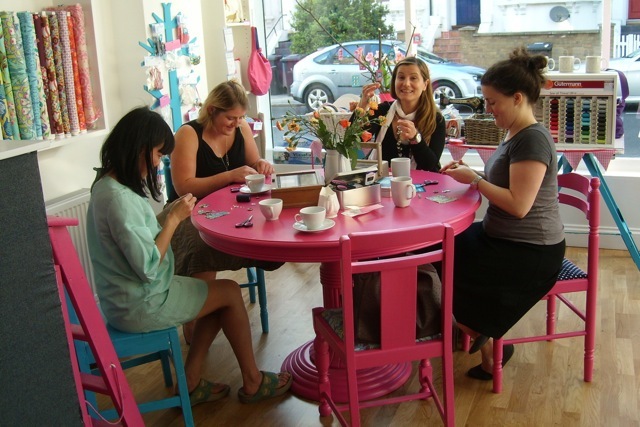 We have women of all different ages from 20s to 60s but mainly most of our customers are in their 30s. We recently had a guy in one of intro to sewing groups and the rest of the group treated him like a celebrity and cheered when he arrived each week! He was lots of fun and often some great banter to the group and was really good at sewing. I leave Sew Over It soon after the classes finish at 9.30 and head back home in Lucia. I usually only have soup when I get in as it’s quite late. Then I catch up with Matt, check my emails one last time and go to bed around 11.30. When I work from home my days are more relaxed. I usually go for a swim first thing and have a more leisurely start to the day. I am writing a book at the moment so I am working on that – deadline is looming! Or I do my accounts – far less interesting. I also go to my fabric wholesalers and run errands. The variety in my days is one of my favourite things about having my own business. No two days are the same. I am never bored and I am constantly learning. I have had to learn basic accounting, and cash flow forecasting. I have learnt how to update my website and how to write press releases amongst many other things. It’s not all bliss, I am more tired than I have ever been and have a lot less time to see my friends and family. I guess that is the sacrifice you have to make initially. For the first six month I put Sew Over It first in many ways. But now I am trying to find more of a balance and a sustainable way of living. It is very hard when you have your own business not to ever switch off and become a bit of a control freak about it. At first I felt I could never leave the shop in someone else’s hands. But now Domnique looks after it on a Friday and Sunday and she does a great job. This means I can work from home a couple of days a week and have a proper day off as well. Sew Over It is like my baby, but it is still just a job at the end of the day, and I have to keep reminding myself of that. Someone told me just before I started to set up Sew Over It that to really think about it because once you have a business, that’s it you are tied to it and life will never be the same. It will consume so much of you. She was right and I think it is important to think about that before committing. That would be my piece of advice to thinking of setting up their own business. But for me my life is a lot more fulfilling with Sew Over It in it and I wouldn't change it for the world." Thanks Lisa! Best of luck growing your business... and writing your book, setting up your online shop, starting your own merchandise line... phew!